I really enjoyed the class yesterday with Nagato sensei. As usual we began the class with the new Godan. During this session, I focused mainly on Nagato sensei’s footwork, which is, as you may know, quite different from Noguchi sensei’s. The movement was the usual attack with migi tsuki. Nagato sensei avoided the attack by controlling / absorbing the attacking arm from the outside at the elbow / forearm level with his own right elbow. Then switching arms, he made his Uke pivot to the left, and pushed right Shutō into the jaw. What was interesting is that Nagato sensei sidestepped with a small step to the left with his left leg. Controlling now the inside of Uke’s arm, he pivoted clockwise with the body, putting his right leg nearly behind and in line with the front leg. This precise stepping opened a Kûkan, in which the switch omote / ura was possible. Uke’s body was being repositioned, and Uke was suddenly fighting for his balance. The resulting Migi Shutō was unstoppable. The end of the movement included many variations around Omote Gyaku / Oni Kudaki / Yuji Kudaki. The Kaname here, was that the sidestepping during the attack, was done close to a 90° angle. And with a perfect Kyori. Not too close, but not too far. Always balanced, Nagato sensei was able to step forward, and deliver the Shutō naturally. The Shutō was more a push than a hit. Uke being pushed backwards, his body bent forward in reaction, to compensate for the force being applied. This unplanned reaction of Uke’s body opened the possibility for the Gyaku to be applied to the right arm. Later, we did the same by absorbing the Tsuki with the chest, from the outside, keeping Uke’s hand stuck to the body. The footwork was the same, only the angling was different. Wrapping the thumb with the right hand, Nagato applied Yubi Kudaki, and created the space for the Gyaku (Omote Gyaku, Oni Kudaki) adjusting to Uke’s reaction. There were many other variations including kicks to the groin from the inside. Rico, his Uke at the moment, have enough bruises to testify. The two different ways of doing this “Uke Nagashi” are possible because the initial footwork was perfect. No wonder that Hatsumi sensei’s videos are subtitled “martial arts of distance”. The proper distancing is created by this dance-like footwork. When Nagato sensei was doing it, I was amazed to see how soft and natural his taijutsu was. There was no unnecessary force used in the process, only perfect Kyori. When we began the cycle of Juppō Sesshō back in 2003, I remember sensei explaining that our movements should resemble those of a bossa nova dancer. To me Nagato sensei’s moves looked like bossa nova. When you become able to do that, you are always balanced and this is why Uke, trying not to fall, is trapped by his body reactions. Proper distancing and footwork, create an unconscious change in his mind. From the “attacking mode”, Uke’s body switches to “surviving mode”. Uke is not in control of his actions anymore, his body reacts to unseen dangers, but he is always too late. Yamaoka Tesshû says that “outside the mind there is no sword. When facing an opponent, do not depend on the sword; use mind to strike the adversary’s mind. This is no sword.” This is exactly the same that is happening here but with taijutsu: get Uke’s imaginary fears work for you. When you master your footwork, distance, angle, and rhythm, your movements are natural. There is no intention. You do what is required by Uke’s suicidal reactions. Real fight is mental not physical. But to teach the mental state, one needs to develop first the physical state. The “Zero intention” of Mutō Dori taught by Sōke these days, is the result of highly trained basics, and ingrained knowledge of body mechanics. When the fight unleashes, it is too late as your brain will be frozen. Your body will react by itself. If you have good taijutsu foundations, you’ll be able to survive the fight. If you don’t, then it’s too late. 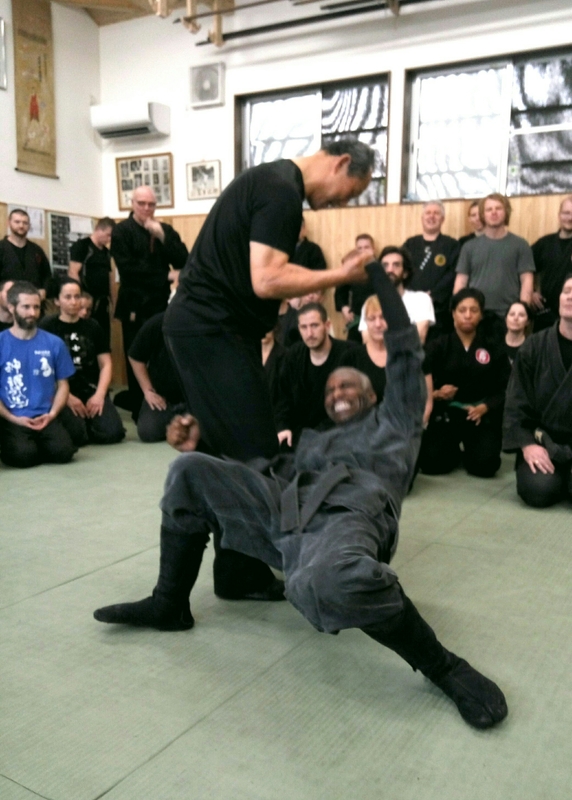 The “ninjutsu is formless, everything goes” that was famous in the 80s, has been widely spread and bright a lot of misconceptions in what we actually train. You can forget the form only if you have trained the forms extensively. This is not magic! Train your basics slowly, study the Waza thoroughly, learn about your body and its possibilities (strengths and also weaknesses). Slow motion will get you there. This is not sport, this is survival training. Very interesting. Thanks for sharing your thoughts, Arnaud.